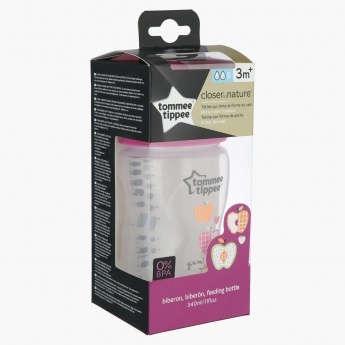 Tommee Tippee Feeding Bottle - 340 ml | Pink | Natural feel teat for "just like Mum" feedings. An easy transition is now possible for your toddler from breast feed to bottle with this feeding bottle. Featuring an ergonomic design, this bottle comes with an optimum venting valve for minimum discomfort to the baby.